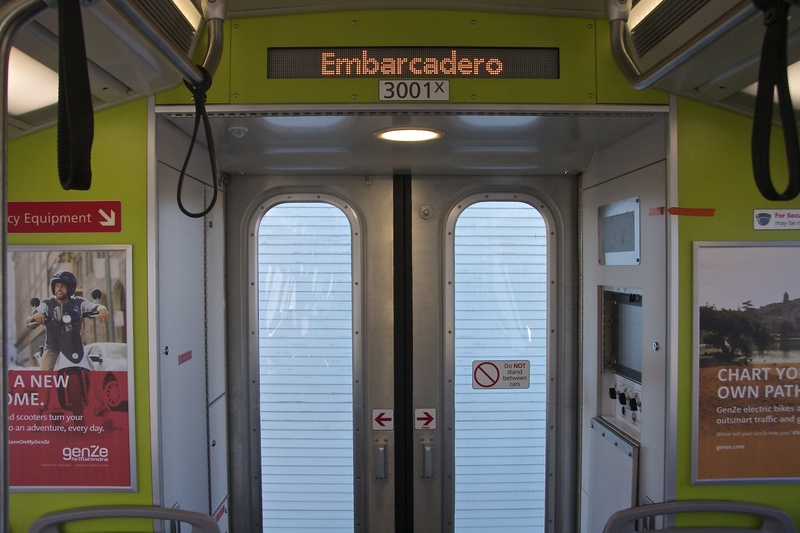 The new train cars will expand the BART fleet and provide much-needed crowd relief. The goal is to order a total of 1,081 cars, which would increase the number of seats in the BART fleet by 49 percent. Also according to the BART web site, there isn’t enough spare track space to do an open house in San Francisco. Engineers, train operators, designers, BART board directors and other officials were on hand to answer questions and demonstrate features of the new train cars. The trains certainly look different and are chock full of new features. The cars, thanks to LED lighting and light green and blue seats, immediately seemed much roomier and brighter. There was also a “new car” smell. The seats have two inches of cushion, but are firm and comfortable. 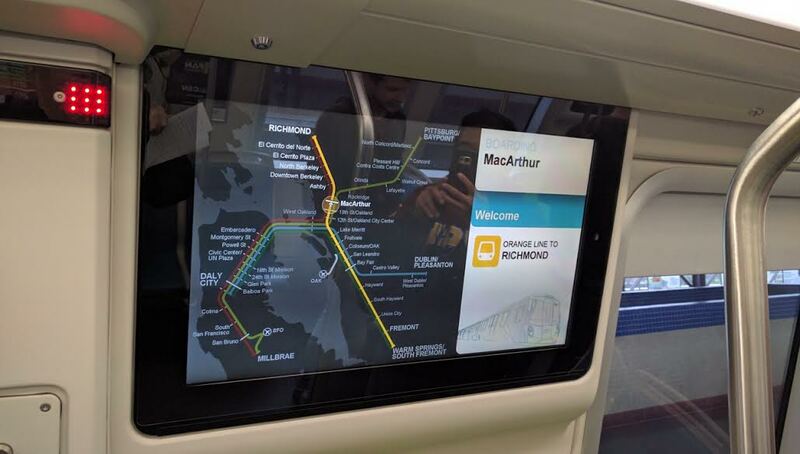 The BART maps inside the train are now digital and show the current location of the train on the map. Gone will be the days of looking up at one of the Mission Stations and trying to figure out if its 24th or 16th. 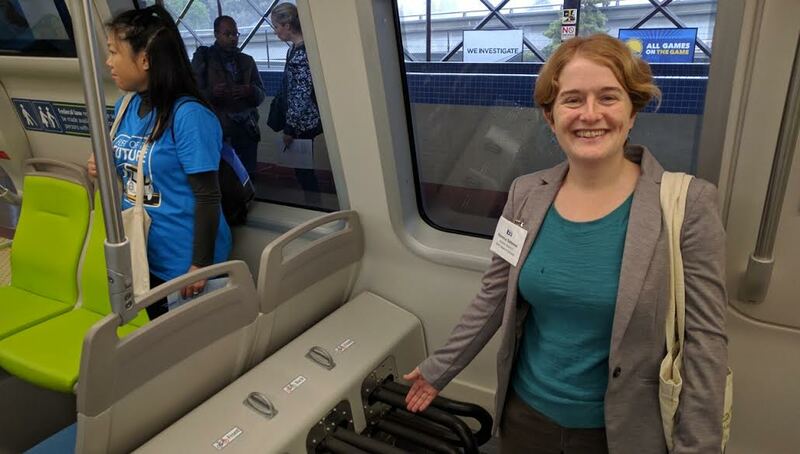 Streetsblog ran across two BART Board Directors, Rebecca Saltzman, of District 3, and Robert Raburn, of District 4. Both proudly pointed out the new bike racks to Streetsblog. “They’re the same ones used on the Copenhagen subway,” explained Raburn. 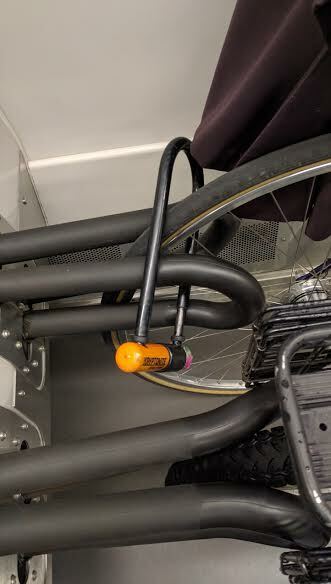 They operate simply–a cyclist pushes the wheel into the rubber grips, which seemed to hold the bikes just fine. It’s also easy to lock a bike up, so a rider can sit down and relax without having to always have one eye on that trusty steed. Streetsblog was glad to see BART using designs from Denmark, rather than attempting to engineer a new solution. About the only thing that wasn’t on display was the ride quality and performance, since the train was static. But Jennifer Gordon, a BART train operator, was on hand. 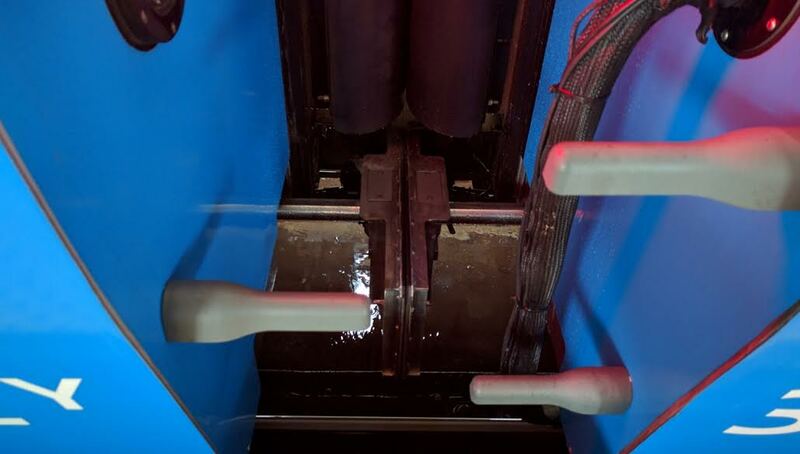 “It’s quieter and smoother,” she said, explaining that the train accelerates and brakes with less jarring, thanks to better computer control of the motors. Shock controlling pistons, mounted between the cars, also help smooth the ride. The train, of course, also has more power, reported Gordon–which one would expect for a train that’s 40-years newer. In theory, a more standard, conical wheel design and better insulation on the doors and windows should also result in a smoother, quieter ride. Streetsblog is hoping to arrange a test ride at some point in the future. There were also a couple of features the engineers talked about that Streetsblog hopes will never, ever get used. See the utility closets at the end of the trains (above photo)? On the older cars, there are seats at those locations. But built into these new cars is an energy management system–also known as crumple zones. 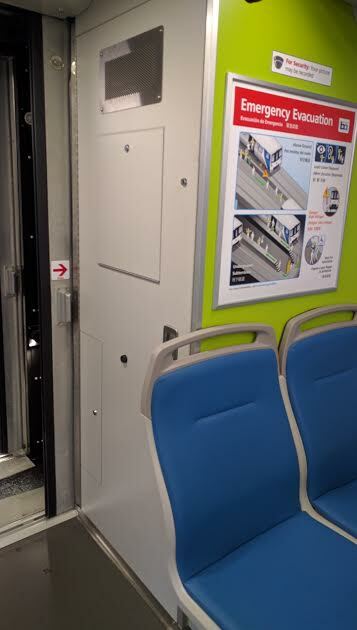 The idea is if two BART trains ever crash into each other, this utility closet area will collapse and minimize the destruction to the rest of the train–and its passengers. Of course, the timing of these open houses probably isn’t a coincidence, with the election around the corner and BART depending on Measure RR to completely modernize its infrastructure. 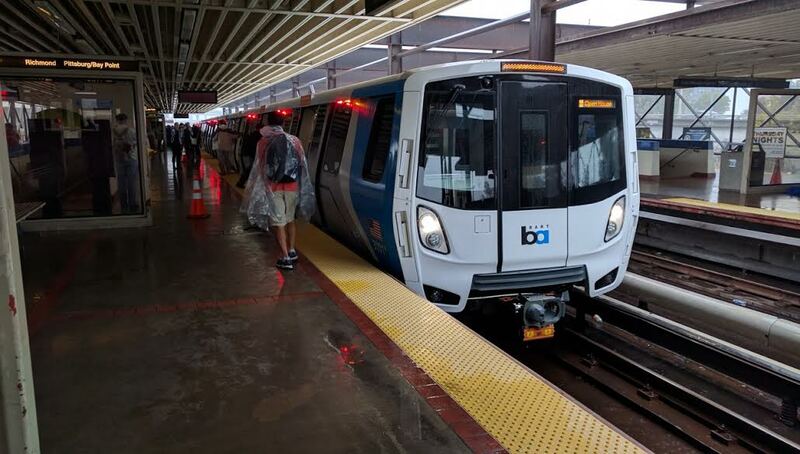 The new cars will also go a long way in making BART better and more reliable. Meanwhile, no doubt many Streetsblog readers checked out one of the weekend open houses. What did you like and dislike about the layout, seats and other features? BART officials were handing out comment cards at the open house, so it’s not too late to make adjustments to the design. Streetsblog suggested the addition of some coat hooks by the seats, so riders have somewhere to put a wet rain coat. Please add your thoughts below. Somehow I guess I knew that BART would screw up the information displays. These are terrible. You can’t see them in bright light, you can’t read them from any distance, and they will all be smashed in the first week of operating. 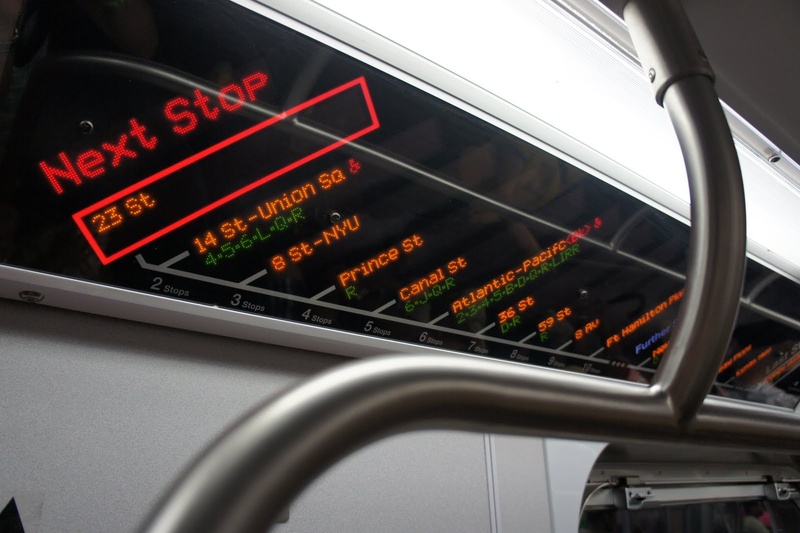 Compare the excellent, bright, readable, durable, and above all dirt cheap LED matrix displays now in use in New York. Don’t worry about it…Clear Channel will no doubt pay for any replacement. Anything to keep those advertising dollars flowing. So no full-width gangways between cars? I thought crowding is a big driver for new cars, but maybe it’s not bad enough after all. 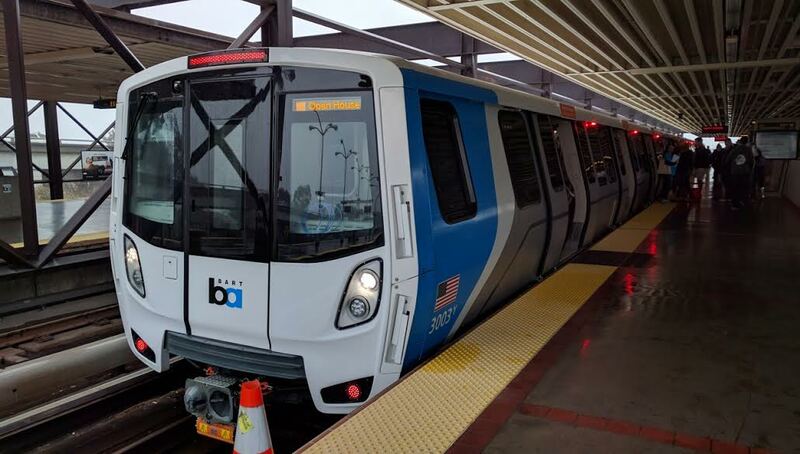 I heard that this was considered, but BART wanted the flexibility to be able to resize trains quickly and this design allows them to use cab cars in the middle of trains when needed. Want to turn a 6-car train into a 10-car train? Just pop four more cars onto the front and you’re ready to go, with no need to remove or swap out any cars. There may be other factors as well, such as better climate controls, crash safety buffer zones at the car ends, and so on. As long as the gangways are still open so people can move from car to car when needed then I’m happy. BART needs to drop this habit and run ten cars on every train. Not only does this simplify operations and remove design constraints, but it could possibly lead to passenger comfort as well! You are repeating a lot of zombie myths about articulated trains. Articulated trains can just as easily be resized as regular trains. At the end of the line, BART takes one long train and breaks in two (or vice versa). Articulated vs. non-articulated makes no difference for that operation; both types of trains can have a cab car in the middle. So why did BART choose the closed design if there are no benefits? I’m honestly curious as I don’t personally have a preference either way. And “because they are morons” is not a reasonable answer. As I understand it that’s the plan once the full new fleet is acquired. As-is they simply don’t have enough train cars in the fleet to do so, without increasing the train headways. “Because they are morons” is the only reasonable answer here. 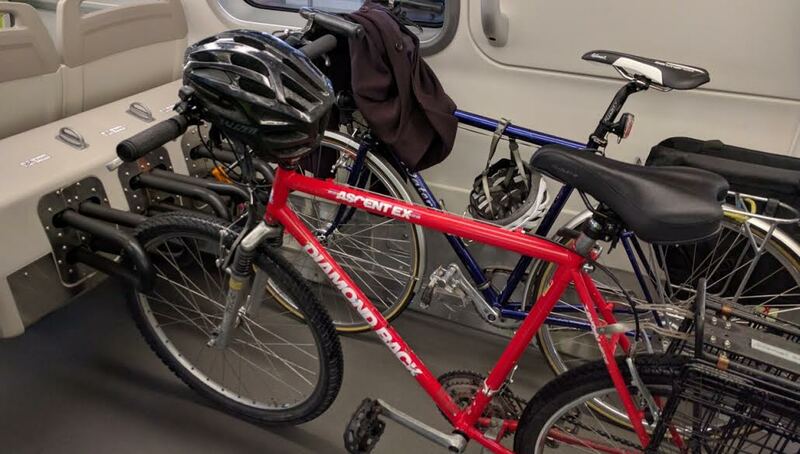 BART is dealing with crush loads and articulated trains would have increased the amount of usable space — for both passengers and bikes — on the trains. Yes, I saw the cars at MacArthur. 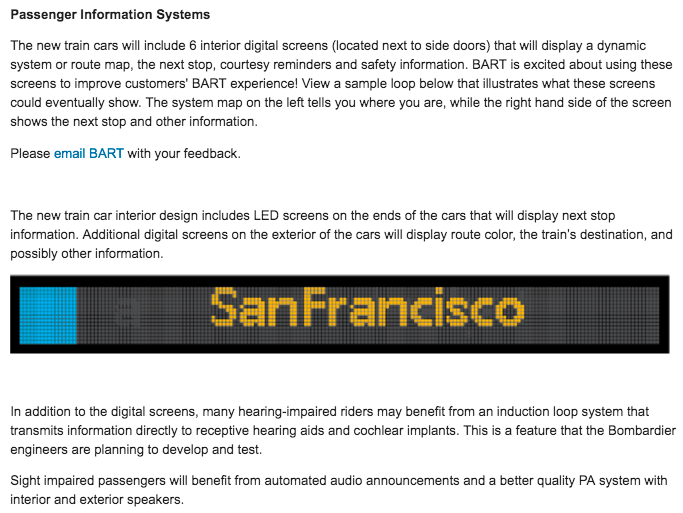 That mock up is symptomatic of BART’s problems with information design and wayfinding. First off, obviously, there is a space between the two words in San Francisco. Second, San Francisco is not a destination. There are 9 stations in that city. Some trains turn back at Montgomery, others at Daly City. Finally, the color of the line is totally irrelevant because BART is not a multi-route system. Between any two points on BART there exists exactly one route. Indeed the color codes change meanings on weekends and in the evenings, rendering them pointless. Only the terminal station is relevant. That image is of the panel outside of the train, as noted above. The interior LED sign is not shown here. Excuse me if I categorize this as lazy criticism. I know it’s popular to crap on BART, but from my experience this typically comes via a lack of understanding about technical design criteria, limitations, or compromises made intentionally due to factors unavailable to the critic. Armchair criticism can be accurate, but I at least try to give the benefit of the doubt until I can do my research, after which I almost always learn relevant information I wasn’t aware of at the outset. “They’re morons and the solution is obvious” is the lazy way to explain away things we don’t agree with, and avoid doing the hard work of actually taking responsibility and engaging oneself by digging in, understanding why decisions were made, and working to untangle the complexities which led to those decisions. Articulated trains with open gangways makes for one long continuous passenger space. It’s the way to go. Check out São Paulo’s new yellow line #4 … which is also driverless with platform screens and runs off overhead busbar. I’ve ridden it for weeks while there for work … very, very, very nice compared to BART. And that single line carries about twice as many riders per day as all of BART. I would assume the production design for the exterior train displays would show the “end of line” route name on the display, to match the info on the station platforms. The route color does matter in the East Bay with regard to the Richmond and Pittsburg lines, and the Dublin and Fremont lines. Even when that info isn’t needed it still doesn’t hurt anything to include it. Depends how you define “multi-route”. I’d say CalTrain is a better example of a single-route system. There is only one line and no interchanges except to a different system. Compared with that BART has 4 branches in the East Bay, with interchanges at MacArthur, the central Oakland stations and BayFair. On the SF side you’re more correct, with only the trivial split between SFO and Millbrae. Again, I think you’re using “route” in a strange way there. Obviously there is only one route between any two stations. BART doesn’t have redundant track with the possible exception of SFO to Milbrae. That’s why a train stalling anywhere on BART is a disaster. But BART is still a true network (a better word to use). So is the Muni streetcar system, although rather one-dimensional until the Central Subway is working. The biggest and most meaingful distinction is between a transit network like BART and a single route operation like CalTrain. Millbrae has an extra track for viewing for people in SF and the peninsula. The doorways between cars seem wider and the doors themselves are easier to open. The doors were open for the open house, but one of the engineers showed me how they worked. Hopefully this will enable people to move between cars with less hassle. compromises made intentionally due to factors unavailable to the critic. Meanwhile, in the entire rest of the world, BART’s “expertise” is unwanted, it’s employees and consultants unemployable, and its technical design risible antiques, or worse. But SPECIAL LOCAL CONDITIONS! ARMCHAIR QUARTERBACKS! YOU DON’T UNDERSTAND THE CONSTRAINTS! SPECIAL SNOWFLAKES! THERE ARE FACTORS I CAN’T REVEAL WHICH WOULD CLARIFY IT ALL. So why did BART choose the closed design if there are no benefits? Indeed, Because they are morons” is the answer. Olde Tyme American Railroading involves “cars”. BART’s scandalously low-productivity, low-availability, high-cost maintenance division couldn’t imagine life without “cars”. “Cars” are what they do. (Or what they park out of service for large fractions of their lives.) “Cars” are what the “fleet of the future” will have. Same story at Caltrain, BTW. America’s Finest Transportation Planners, bringing you yesterday, tomorrow. Ok. So BART can either provide more capacity during rush hour or have more flexibility for shorter trains, but not both. Clearly more passenger capacity and comfort is less important than ability to run short trains.